Follow the steps below to copy or merge One Copy/One User & Metered Access carts in Marketplace. Note that Simultaneous Use carts can't be copied or merged. Click Carts in the upper-right corner of the screen to access your carts. 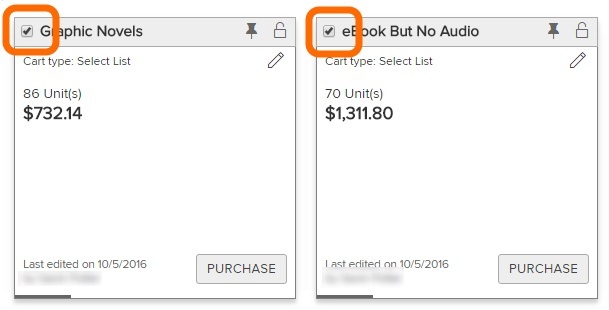 Select the cart you'd like to copy or carts you'd like to merge using the checkbox in the top-left corner of each cart. Click Copy/merge cart(s) near the top of the page. 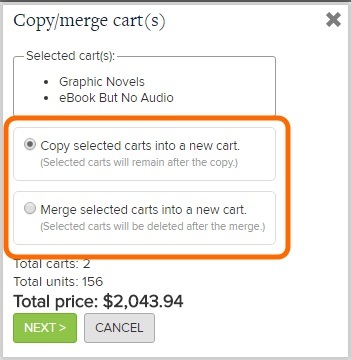 Select Merge selected carts into a new cart or Copy selected carts into a new cart, then click Next. Enter your new cart's name, and set up additional cart options as desired.